Soft, deep, effective and fun cleansing!!! LUNA mini 2 is a device for skin care and cleansing available in a practical compact in vibrant colors. A facial cleansing brush with advanced T-Sonic ™ technology, which has 8 adjustable intensities for a fully adaptable cleansing experience. An exceptional device suitable for all skin types! Improve the appearance of skin in 3 days, with only 1 minute of use, twice daily. Impurities that cause stains are removed, thereby improving the absorption of other beauty product and leaving the skin with a smoother, healthier and bright appearance. The secret behind the LUNA mini 2 is in the T-Sonic pulsations and soft and smooth filaments of its silicone brush technology. It's this combination that allows you to delicately remove dead skin cells and makeup residues, and eliminate 99.5% of waste oils and retained in the pores for better absorption of your skin products. Choose the color that best fits your personality and start your day with this beauty ritual!!! Apply the regular cleansing cream. Wet the LUNA device and turn it on. Apply your usual facial care. Based in Sweden, FOREO was born to illuminate and facilitate your daily beauty routine, full of style! 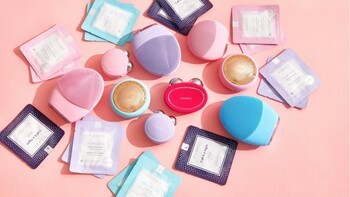 Get to know all the beauty gadgets!